Iqraam Rahim’s Rampage Dance Company will present NAACH - My Diary of Dance, a celebration of dance from a South African Indian perspective on August 19 at The Playhouse in Durban. The cast comprises some 30 performers, made up of students from Crawford, Northwood, Verulam Secondary, Seatides Combined DHS, Maritzburg College, St John’s College, Our Lady of Fatima and the University of KwaZulu-Natal. Says Rahim, one of the choreographers whose work is featured in the forthcoming movie, Keeping Up with the Kandasamys: “NAACH - My Diary of Dance is the only proudly South African Bollywood dance production of its kind. It communicates the values, aspirations and challengers of a dancer through spoken word diary entries (spoken by word artist Sanam Sitaram). The production aims to distinguish genres of dance such as folk, classical, and contemporary styles within a Bollywood framework. 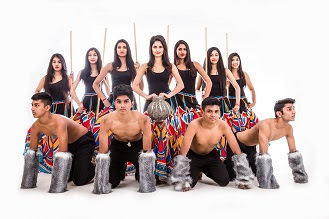 The production will also feature a special guest appearance by professional dancers Vedarsha Singh and Kashmir Pattendeen who will perform a new dance number especially choreographed for them by Iqraam Rahim. Audience members are invited to sing along to favourite old school tunes (Pyaar hua, Juta Hai Japani, Yeh Dosti, Samne Wale Kirki), dance to favourite songs (Jag Ghoomeya, Deewani Mastani, Baby ko Bass Pasand Hai), or simply watch a sensational dance production enjoyable for the whole family. Added to this event will be an art exhibition featuring three local artists - Sonaly Hurdayal, Neha Misra and Thirusha Chetty - as well as a choreographic debut by Yuthika Nagessur, the evening stands as an art festival featuring artwork, dance work and spoken word. The performance of NAACH - My Diary of Dance at The Playhouse on August 19 starts at 19h00. Tickets R150 available at Computicket on 0861 915 8000 or online at www.computicket.com. Alternatively bookings can be made through The Playhouse box office on 031 369 9540 (office hours).